You would be right in many ways if you said that Twitter clients figuratively cost ten cents for every twelve apps you can round up. They typically compete in terms of redesigning the Twitter experience instead of bringing new features to it. Kiwi 1.0 from YourHead, however, is one of those rare standouts that deserves to be on the premium shelf. Of course, Kiwi offers all the Twitter basics. You can add one or more accounts, tweet, reply, retweet, send direct messages, share images and shorten links via your choice of services, and generally have a good Twitter experience. Kiwi earns premium placement on virtual Twitter store shelves, though, by bringing some unique features like themes, Groups, and Rules to the table. It ships with nine pre-installed themes that basically restyle your timeline, adding unique backgrounds, unread badges, and other visual aids. Soon, designers will be able to contribute more Kiwi themes for download from KiwiThemes.com. For anyone who needs more control over their Twitter streams, Kiwi's Groups and Rules features are a bit more interesting. Groups allow you to combine the timelines of two accounts into a single window. So, for example, you could read the streams of both your personal account and your company/website/product account in the same list. You could even add a Twitter search as well, offering a lot of timeline-combining power. Rules may be Kiwi's true bread and butter, at least for power users. Much like the filters or rules that you can use in your email client, Kiwi can watch for keywords and highlight tweets with a certain color, or even hide them altogether. Yes, that's right: if you are jealous over had a scheduling conflict with a conference that all your friends are tweeting from, you could dull the pain stay focused by creating a rule in Kiwi to hide all tweets that contain the conference name or #hashtag. 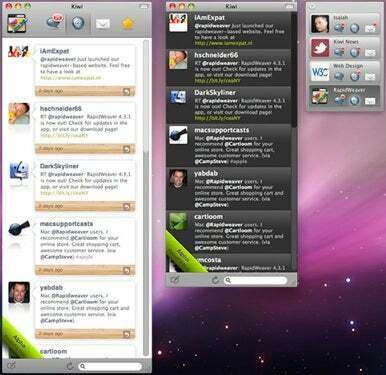 Kiwi 1.0 is available now for download, requires Mac OS X 10.6 Snow Leopard, and costs $15.